The greatest growth in international Australian Rules Football in recent years has been in the island countries surrounding Australia. Their location makes this no surprise, but until the 1990s, there was no real sign of the developments to come. Now two strong countries have emerged, with New Zealand and Papua New Guinea numbers exploding, and several new nations have begun the struggle to establish the sport. In this, our latest in the 2004 Census series, we will leave the most dominant countries, New Zealand and Papua New Guinea, until last. As always, note that for adults or juniors to be considered, we have required they play approximately four games in 2004, but emphasise that this does not discount the great work done in Auskick-style clinics. Unfortunately the story of this tiny country is very sad. For decades it was exploited by Australian mining companies for phosphate. Australian Rules became the island's number one sport, so much so that many people bear the name of Australian football greats. As the phosphate began to dwindle, greater compensation was sought than the royalties that had been paid. Millions were given and Nauru invested the money, often on the advice of Australian businessmen, with very little success. One such investment was a share of the ill-fated Fitzroy Football Club, in the VFL and then AFL. It seems that the country is now in very dire straits, with little income or assets, and it appears that its football competition may have collapsed, along with other aspects of Nauru life. So it seems unlikely that any regular football is being played there, but we haven't been able to determine this for sure, and they are listed as attending the 2005 International Cup. We'll give Nauru the benefit of major doubt, and list the last known information about them, but assume that no juniors are coming on. Let's hope we're wrong. Total teams 10, senior players 300, juniors 0. This nation of small islands has a population of roughly 200,000 people. 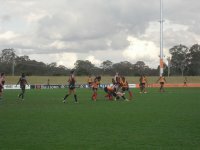 It is still very new to Aussie Rules, and so surprised many with their athletic play in the 2002 International Cup. It appears that there are only now 4 senior teams, with the focus being on junior development, which should bring success in later years. Total senior teams 4, senior players 80, juniors 166. Samoa's relatively near neighbour and arch rival, Tonga is a very fresh face in international footy. Although some adult matches have been played, the focus has been squarely on developing a sound administrative and junior structure. Their first toe in the water of international competition came with a schoolboys tour of Samoa last year. Total senior teams 0, senior players 0, juniors 105. The Solomons are also a new kid on the block. Lying near PNG, these islands have been troubled in recent years, but there has been a peaceful period with Australian Defence Forces helping restore calm, to the relief of the vast majority of the country. With little sport in the population of around half a million people, the country is looking for support and is ripe for the introduction of footy. They were frustrated by not getting a development officer recently but hopefully will persist. The first steps have been taken, with 2 senior teams playing friendlies, 30 adult players, and 150 juniors. The Kiwis have long been exposed to Aussie Rules, although as keen sporting opponents of Australia, perhaps the name of the game has not always helped. After struggling to make head way, the last 10 years has seen impressive growth, particularly at the junior level. Hopefully the next few years will see this translate to more senior teams. Currently the boom is within schools, but effort is also being put into developing junior competitions outside of schools. NZ perhaps lacks the higher profile that PNG has by having its junior pathway allow talented youngsters into the AFL Queensland system. But the numbers certainly seem to stack up well. Recently a fourth senior league, Waikato Thunder (WTAFL), around Hamilton (south of Auckland) has begun, adding to Auckland (AAFL, which includes reserves grade), Wellington (WAFL) and Canterbury (CAFL) leagues. Overall, there were 22 senior clubs, 536 senior players and 10,690 juniors (! ), that fit our criteria. The other big gun of Oceania, PNG has being playing Aussie Rules for decades, but in the last 10 years things have really started to move. Through a lot of hard work, major engagement with the local community, support from major companies, and a great relationship with AFL Queensland, junior numbers are sky-rocketing. They also have a head start on New Zealand in senior players, so they may have their noses in front in the race to be considered a very serious Australian Rules nation. With high hopes of players being drafted into the AFL in the next 3 or 4 years, that title may already fit. Below we have listed the teams in the National Capital District (NCD) league, based around Port Moresby (and featuring a reserves grade), but due to the large numbers, we have settled for simply listing the other leagues, and the number of players in them. The majority of the juniors play in schools competitions called Educo Raitman, with 6 - 10 teams in each year level in Port Moresby alone. There are also PPR and Raitman short programs, and if we were to include those numbers, the junior total would be around 35000! So, the big numbers: 64 senior teams, 1920 senior players, 8000 juniors. Fiji also took positive steps in 2004, but appeared to be mired in meetings rather than games, and do not qualify under our criteria. Hopefully we'll see them up and running in future. So in summary, Oceania has 6 countries with established teams, excluding Australia, which we will look at later. Overall numbers are dominated by PNG and NZ. The total is approximately 2866 senior players across 102 senior teams, and an extremely encouraging 19111 juniors. Growth in most of these countries is somewhere between steady and amazing. In PNG, we may see Aussie Rules become the number one sport for only the third time in the world, after Australia and Nauru. Including Auskick, numbers could top 70,000 in 2005, although as always, resources are tight. Oceania remains odds-on to produce the AFL's first genuinely "home grown" recruit (i.e. developed in an international Australian Rules league). Note: The figures for NZ and PNG are primarily dependent on data supplied by those countries. AFL criteria for measuring player numbers is more strict than those we used, and they more conservatively estimate numbers for NZ at around 1000 and PNG about 3000.